Growing pollution concerns, rising adoption of electric vehicles, increasing income-levels and surging demand for quality and uninterrupted power are some of the key factors catalyzing the growth of Lithium ion batteries market in India. Further, rising usage of smartphones and other consumer electronics products is resulting in an increase in demand for higher energy density and faster charging solutions. Additionally, growing consumer electronics market would drive the India Lithium Ion Batteries market forecast period revenues owing to its light-weight, high energy, and power capacity features. According to 6Wresearch, India Lithium ion Batteries market size is projected to grow at a CAGR of over 27% during 2017-23. Consumer electronics segment captured majority of the market share followed by automotive applications and others. Among various Li-ion chemistries, Lithium Cobalt Oxide (LCO) dominated the market owing to its high usage in consumer electronics. Additionally, increasing awareness towards portable and stationary energy storage coupled with government's push towards solar and wind projects are expected to contribute to the growth of India Li-ion Battery market share over the coming years. Moreover, government efforts towards adoption of electric vehicles such as Faster Adoption and Manufacturing of Hybrid & Electric Vehicles (FAME) scheme as well as tax exemption on EVs are anticipated to provide much needed boost to the market. The India Lithium Ion Batteries market report thoroughly covers lithium ion batteries market applications, components, material types, and power capacities. 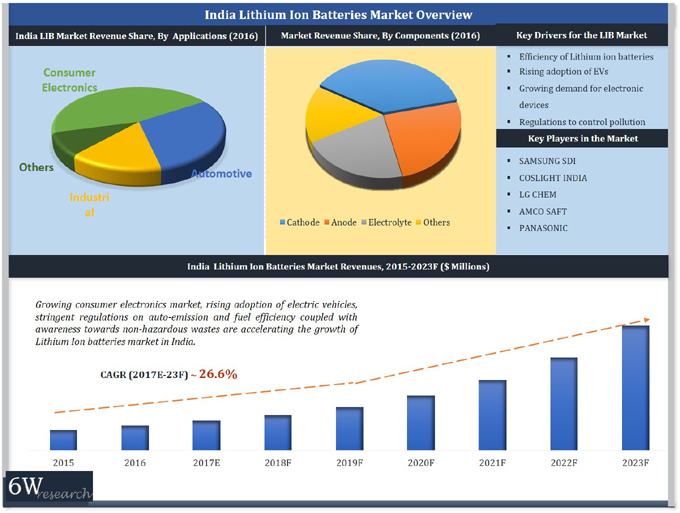 The India Lithium Ion Batteries market outlook report provides an unbiased and detailed analysis of the on-going India Lithium Ion Batteries market trends, opportunities/high growth areas, market drivers which would help the stakeholders to decide and align their market strategies according to the current and future market dynamics. 12.1	Samsung SDI Co. Ltd.
12.2	Sony India Pvt. Ltd.
12.3	AMCO Saft India Ltd.
12.4	Panasonic India Pvt. Ltd.
12.5	LG Chem India Pvt. Ltd.